Bryan’s Review of ‘Brooklyn Brothers Beat The Best’!!! 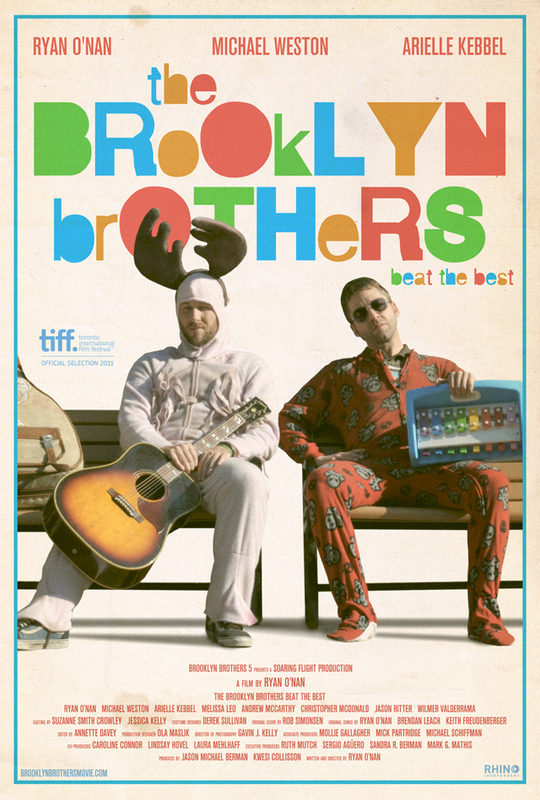 ‘Brooklyn Brothers Beat the Best’ is a bright ray of light in the indie film scene. Ryan O’Nan’s debut film is a mature, coming- of-age story that brings two lost souls together for a bizarre musical journey across the United States in a beat up old car. The characters sport enough wit and charm to warm audiences to their core. This is a wonderful little film with an original soundtrack that younger-generations will eat up. Ryan O’Nan takes on triple duty with ‘Brooklyn Brothers Beat The Best’ as he directs, writes and stars in the film. One might say this is almost impossible to do, but O’Nan pulls it of with grace as the film looks beautiful, the original music is catchy, and the writing is brilliant. ‘Brooklyn Brothers Beat The Best’ follows Alex (O’Nan) who is an approachable yet worn man who works a dead end job where his boss and co-workers hate him. 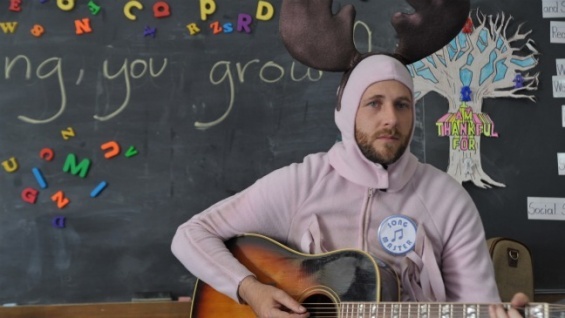 Alex moonlights as a struggling musician where his gigs consist mostly of dressing up in a pink moose costume and singing for a group of mentally handicapped kids. After a funny confrontation with one of the kids that leaves his pink moose costume bloodied, he is asked not to play at any more school functions. Alex is drinking on a park bench and dwelling on his failures and sadness, when Jim (Michael Weston) (possibly Alex’s only existing fan) approaches him. Jim practically kidnaps Alex and proposes that the two of them embark on a country-wide tour, performing their original music that they have yet to write. The kicker is that the tour starts in 24 hours and all the venues have been booked. While Alex plays the guitar and sings, Jim has a much more outlandish and eccentric talent. He has collected plastic toy instruments and creates loops and samples to go along with Alex’s depressing songs about heartbreak. Jim even describes their band as “…kind of a Shins-meets-Sesame Street sort of thing.” The scene where Jim and Alex are making and recording music as they are driving to their first gig is unforgettable. At that precise moment, I knew that I was going to love this movie. At their first gig, they meet a wannabe concert promoter by the name of Cassidy (Arielle Kebbel) who joins them on tour as they make their way to California for a Battle of the Bands contest. From here, the three travelers come across some unorthodox characters and scary situations as they try to find and prove themselves as artists. This film is filled with brief cameos made by Andrew McCarthy, Melissa Leo, Jason Ritter, and Wilmer Valderrama. They all do a good job, but the main acting credit goes to O’Nan, Weston, and Kebbel. They pull off their tortured yet undeniably likeable characters so well, that I rooted for them till the end of the film. O’Nan’s eye for direction is one to watch out for in the future. His vision of a few lost souls on a musical road trip was great. It showed the raw and at times beautiful visuals of the country and characters. ‘Brooklyn Brothers Beat The Best’ is a remarkable indie film. The film is quirky, original, and a lot of fun. I see the younger demographic really enjoying this film with a few aging hipsters following along. 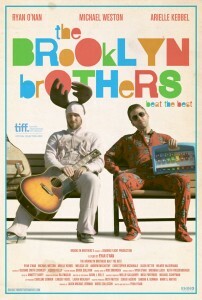 Once you see the Brooklyn Brothers actually perform, you will know that they really do beat the best. This entry was posted on Sunday, April 22nd, 2012 at 11:22 am	and is filed under Film, News. You can follow any responses to this entry through the RSS 2.0 feed. You can skip to the end and leave a response. Pinging is currently not allowed. « ‘God of War: Ascension’ Has A Trailer!! !